Securing a reservation at Eleven Madison Park isn’t impossible – you just need to be punctual and quick with technology. A month prior (April 1 for the month of May), online reservations are loaded promptly at 9:00am. A quick refresh and a whole new month became available in the calendar! ‘Reserve’, I chose (the split second it opened) and the 7:00pm reservation is gone. Another click and 6:45 greys out as well. I frantically click away … finally, I land a 6:15 table on my chosen Saturday. 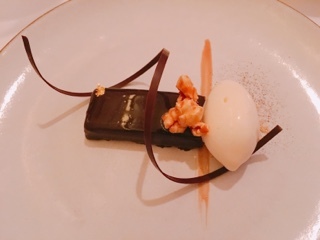 The minute affair got my heart pounding, but at least was over quickly – unlike the boredom inducing, time wasting effort of securing a table at the French Laundry - who even uses telephones anymore? 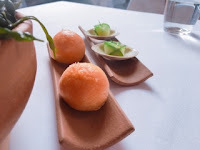 As it turns out, May was a good time to visit as the restaurant offered an 11-course menu ($295 inclusive of gratuities but before taxes) of their most influential dishes from the past 11 years. This is before the restaurant temporarily closes on June 9th for renovations before reopening in the fall. 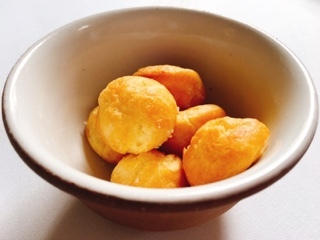 After settling into our table and freshening up with a hot towel, a bowl of warm gruyere gougeres, first served in 2006, was brought over as a welcoming. Bite-sized puffs emitting a light cheese aroma, the first bites were delicious. To avoid sounding like a broken record, in general, I found all the dishes too salty. 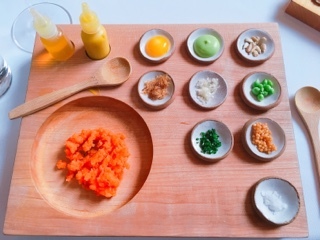 Almost every dish was topped with a sprinkle of sea salt, which would had been fine if the food and sauces weren’t already well seasoned. In reality, that extra flourish of salt wasn’t required – I started scraping off the seasoning from each dish before digging in – and even detracted from many of the seafood dishes. For example, the sea urchin cappuccino’s warm creamy broth was so salty that I couldn’t taste the sweetness of the crab at the bottom … the crustacean merely became an element that adds to the texture of the soup, but not the flavour. This was a similar experience for the following clams. 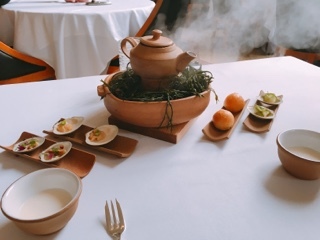 Eleven Madison’s first communal dish, served in 2011, was presented with great fanfare: water is added to the dry ice and seaweed so smoke billows out releasing a seashore scent to augment the experience. 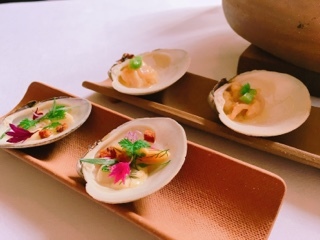 In their version of a clam bake, we’re treated to a velvety velouté and a series of little neck clams: a saltier one topped with bacon, simply adorned with daikon, and the most neutral one incorporating a roasted garlic panade (my favourite of the clams). The Parker House roll, a buttery milk bread, was a tad dry on its own, but perfect for dipping into the creamy velouté. 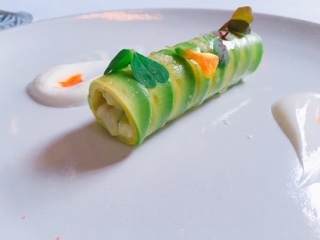 Despite looking rather simple, the prawn roulade’s flavour is rich and complex. The avocado, of course, gives it that creamy texture. Then, within the roulade is a mixture of chopped sweet prawns in a luscious yoghurt reminiscent of devil’s egg yolk. A delicious dish. 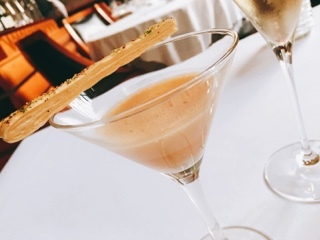 Indeed, the foie gras torchon is gorgeous and I’m sure when it was first introduced in 2004, guests considered it an innovated dish as maple syrup oozes out when it’s cut – it still is, I haven’t had stuffed foie gras before. 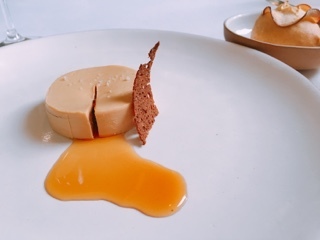 Everything also works so well together – a bit of the warm apple cinnamon bun, a generous piece of melt-in-your-mouth foie gras, then a dip into the sweet maple syrup. It’s like having buttered bread with olive oil to the next level. Although the dish was heavenly, it’s also very heavy. At first, it’s nice that the foie gras essence lightly lingers in the mouth. But, after having the entire torchon that lingering reminds you of how full you’re feeling. It seemed like a shame to waste any of the delicious torchon, but at the same time, its richness detracts from the dishes that follow. So, finish at your own peril. 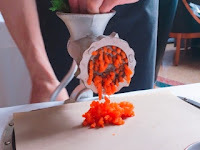 Thankfully, the following carrot tartare was a well-timed dish. A grater is fastened to the table and a small bunch of Hudson Bay area carrots are grated tableside and served fresh. A wooden tray filled with ingredients (a pickled quail egg yolk, pea mustard, sunflower seeds, dried fish, horseradish, snap peas, chives, mustard seed, salt, mustard oil, and mustard vinaigrette) accompanies so you can customize to your own tastes. I added a bit of everything, except for sunflower seeds and salt. Surprisingly, when the various stronger mustard and horseradish flavours combine with the sweet juicy carrots, everything mellows out and works. An almost refreshing palette cleanser after the heavier foie gras. If you’ve ever watch the movie Burnt, pay attention to the fish they serve to a London food reviewer, you’ll notice the dish looks identical to Eleven Madison’s poached turbot. 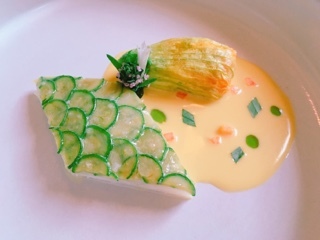 Topping the perfectly cooked fish are thin slices of baby zucchini made to replicate the scales. Although the turbot is neutral, it can still hold up against the saffron sauce. On the side, an amazing zucchini blossom filled with a ratatouille with soft and crunchy bits that makes the dish sing. 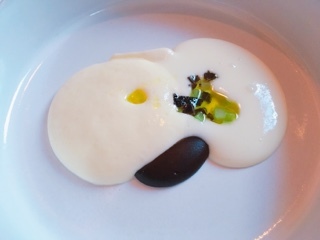 The white blobs may not look like much, but the dish is supposed to imitate a winter in Provence. This was first developed in 2009 as an extra dish the restaurant could send to friends or VIPs. Comprised of a silky potato purée, tangy goat cheese foam, and a sweet beany truffle paste, as you dig into the dish there’s a variety of flavours. Yet, it’s the puddle of olive oil and the diced black truffle and celery bits inside the makes the dish. If only there was more of that, as all the smoothness needs something of substance for interest. 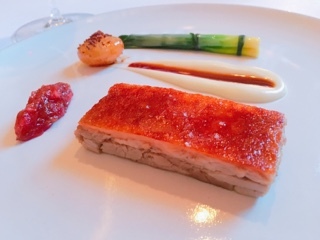 Hands down, the suckling pig confit served at Eleven Madison is the best I’ve ever tasted. As expected, the skin is so thin and crispy it shatters to the touch and the meat is tender and has a strong pork flavour having been slowly poached in lard. Overall, there’s a soft chewiness to the dish that makes you want to hold it in your mouth and savour it repeatedly. 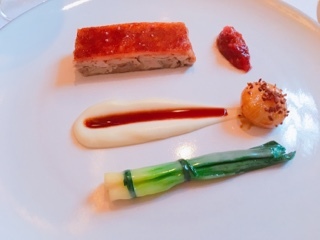 The rhubarb compote, accompanying the suckling pig, had the perfect balance of sweetness and lightness against the rich meat and the braised leek and sweet cipollini onion were nice as well. Transitioning from savoury to sweet, dessert starts with a milk and honey dish that has both elements. 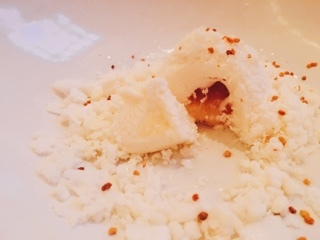 While the dehydrated milk foam sorbet is cool and sweet, the bit of gooey honey filled bee pollen in the centre has a salty element with a grassiness that makes it bitter (a taste I could have done without). All the while, there are sprinkles of other ingredients that provide a coconut and nutty finish to the dessert. My husband’s description of the chocolate palette is rather fitting – like an amazing Wunderbar. There’s the shiny chocolate ganache coating and crispy bits of peanut butter candy inside. In addition, a delicious ice cream that tastes like buttery caramel popcorn. The dessert is rich and delicious, take small bites. To end, our waiter presents a selection of petite fours and welcomes us to take as many as we want. 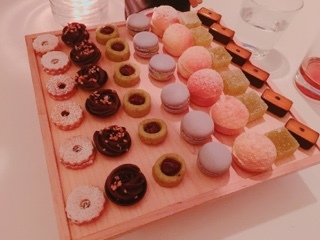 Already stuffed, I decide to stick with three last bites: a fluffy alcohol-laced cream puff, a soft and chewy pistachio tart, and an olive oil gummy complete with sour sugar (the most interesting and tastiest of the three). Before leaving, we’re presented with two shots (and a bottle) of St. George apple brandy, which is made especially for Eleven Madison Park. All the sudden, a table we observed at the beginning of our meal started making sense. When first seated, we looked directly onto a table of four that were finished eating but still having drinks. One couple left and the two remaining guests were inebriated – we’re talking slurred conversations, staring into space, and wobbly walking. At one point, we were wondering if they’d keep their meal down … what a waste! 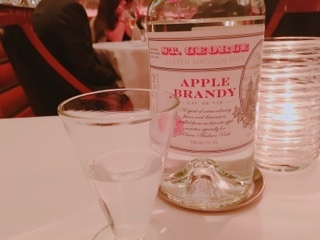 I had commented to my husband that it’s strange a table would order a bottle of apple brandy. It’s normal to get a bottle of wine to share, but apple brandy? That’s a first. As it turns out, every table gets a bottle, it’s just that they normally they don’t finish it. Upon asking our waiter about the situation, he agreed that a finished bottle was the first for them. But, they want guests to enjoy the experience (within reason) and if a table wants a second, third, fourth, or fifth glass, they’re welcomed to help themselves. three Michelin stars and topping the World’s Best Restaurants list in 2017, it’s not pretentious and stuffy. They don’t have a dress code (most men wore jeans and a blazer, while women donned pants or a simple dress), questions are answered frankly, and the bright and airy dining room makes the meal feel casual. Days before the meal, an email arrives re-confirming whether there’s food allergies, special events or anything they could do to make the dinner a pleasant one. I requested a table that had more lighting (to help with pictures) and sure enough, we were seated in one of the sunniest corners of the dining room. If anything, after all that, I was a surprised there wasn’t a follow-up email after the meal. In traditional fashion, guests don’t leave empty handed. 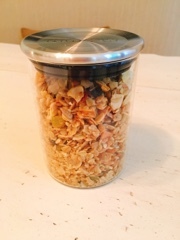 We each received a canister of house-made granola, which made satisfying breakfasts following the dinner. Looking back at the meal, I wouldn’t say it was the tastiest one I’ve ever experienced; nonetheless, the food is good. What makes the dinner memorable is the combination of food, service, and overall environment. After all, where else are you presented with a bottle of apple brandy and they don’t bat an eye when it’s finished?